J50 belonged to the same pod of Southern Resident killer whales as J35, the mother who captured international sympathy by carrying her dead calf for 17 days last month. "Watching J50 during the past three months is what extinction looks like when survival is threatened for all by food deprivation and lack of reproduction," Center for Whale Research Founding Director Ken Balcomb wrote in a press release. "Not only are the Southern Resident killer whales dying and unable to reproduce sufficiently, but also their scarce presence in the Salish Sea is an indication that adequate food is no longer available for them here, or along the coast." J50 had been growing weaker since 2017, and the National Oceanic and Atmospheric Administration (NOAA) had decided this week to take her into captivity in order to treat and potentially rehabilitate her, The Seattle Times reported. But a massive search Thursday conducted by NOAA, the West Coast Marine Mammal Stranding Network, Soundwatch, whale-watching boats and a U.S. Coast Guard helicopter in Washington and the Marine Mammal Rescue vessel, the M Charles midwater patrol vessel, the Department of Fisheries and Oceans, Straitwatch and a Coast Guard helicopter in Canada did not result in any sightings. She was last seen one week ago, Sept. 7, and was absent from a gathering of around 60 whales from her own J pod, as well as K and L pods, on Thursday. NOAA spokesperson Michael Milstein told The Seattle Times his agency had not given up entirely, despite Thursday's declaration. "We have had a huge amount of help today, and it is really important that if she is there that we find her," Milstein told The Seattle Times. "We certainly have not determined at this point that we are giving up. And we are determining that day by day, we are not setting a timeline." The capture effort was the last in a series of increasingly dramatic attempts to save J50, who had gotten so emaciated that she had trouble swimming and keeping her head above water. Veterinarians and biologists in the U.S. and Canada working with NOAA sampled her breath, injected her with antibiotics and fed her Chinook salmon off the back of a boat. Wildlife advocates emphasized the importance of restoring the population of Chinook salmon, the orcas' primary food-source, in the Salish Sea. 'It is a heartbreaking reminder that we cannot save these whales on a case-by-case individual basis. What J50 needed, and what her family continues to need, is healthy and abundant Chinook salmon, which these orcas depend upon for survival," Defenders of Wildlife Northwest Representative Robb Krehbiel said in a statement. 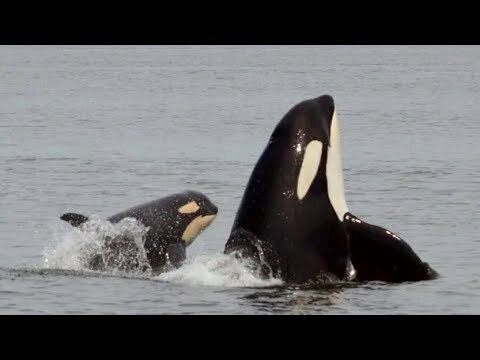 "If we are unable to restore the salmon that these orcas need, more whales will starve to death." The Center for Whale Research agreed with this diagnosis. It called for the restoration of the natural Chinook salmon runs throughout their historic range and recommended the breaching of the Lower Snake River Dams in Washington, which the center said kill millions of salmon. Salmon populations in Canada's Fraser River have been harmed by overfishing and pollution from mining, chemical spills and industrial and agricultural development, the Center for Whale Research said.